In his journal, John Steinbeck called East of Eden "the first book," and indeed it has the primordial power and simplicity of myth. Set in the rich farmland of California's Salinas Valley, this sprawling and often brutal novel follows the intertwined destinies of two families—the Trasks and the Hamiltons—whose generations helplessly reenact the fall of Adam and Eve and the poisonous rivalry of Cain and Abel. Adam Trask came to California from the East to farm and raise his family on the new, rich land. But the birth of his twins, Cal and Aron, brings his wife to the brink of madness, and Adam is left alone to raise his boys to manhood. One boy thrives, nurtured by the love of all those around him: the other grows up in loneliness, enveloped by a mysterious darkness. First published in 1952, East of Eden is the work in which Steinbeck created his most mesmerizing characters and explored his most enduring themes: the mystery of identity, the inexplicability of love, and the murderous consequences of love's absence. 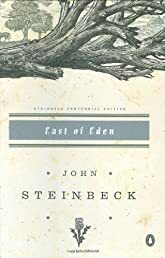 A masterpiece of Steinbeck's later years, East of Eden is a powerful and vastly ambitious novel that is at once a family saga and a modern retelling of the Book of Genesis.